This week, my daughter and I both learned a lesson in perfectionism and letting go. She’s not aware of it, but I am – her lessons are my lessons too, or so I am learning. A small slip up one morning, one that really was of no consequence and not of her own fault but caused by a lack of information, raised all her fears and tears. Already, at 10, she is treading a path of perfectionism, and I am desperately trying to steer her off of it. Because I recognise it and know where it leads. As I watched and supported her to work through her fear, my inner perfectionist – the goody two-shoes, straight-A, high-achieving, do-the-right-thing girl that I always was and continued to be as an adult – felt her same fear. The anxiety of being wrong, of stuffing up, of failing, of being ridiculed. And I wanted to fix it. Desperately. I wanted to make it right because being wrong or different is so very hard when you’ve spent your life trying to do things well, do it right and do the right thing all the time. 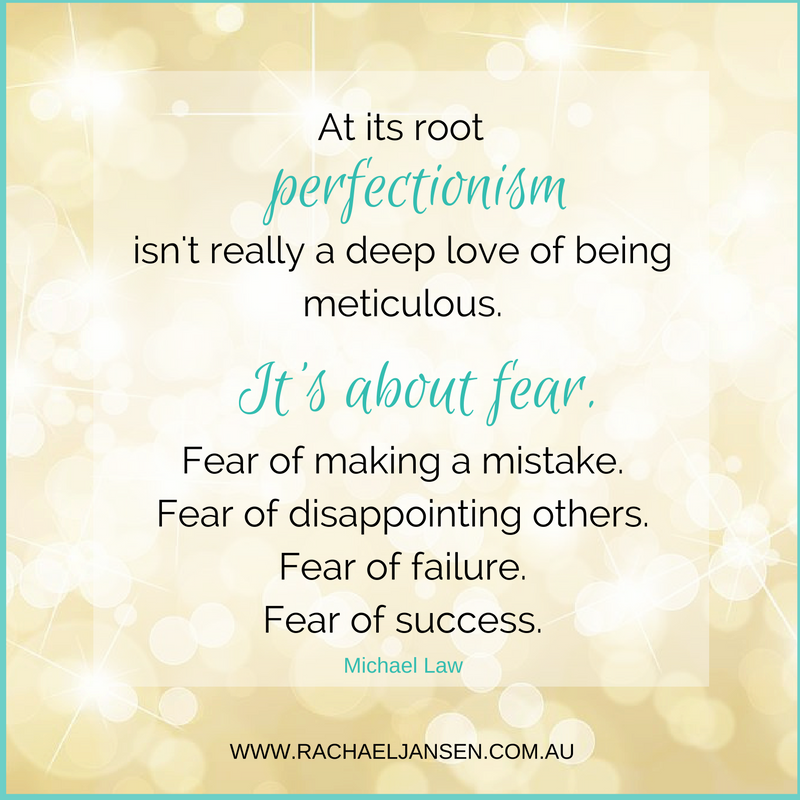 My inner perfectionist, the one who developed all those years ago when I was in my daughter’s shoes, still freaks out when I might get something wrong, or even worse still, if my kids’ get something wrong. So even though I was telling her it wasn’t a big deal – because it truly wasn’t a big deal – my stress response driven by perfectionism was still screaming at me to ‘fix’ it. I could see that for a child who gets it right, day-in, day-out, that getting it wrong even when it doesn’t matter, did matter to her in that moment. I can recognise that, just like I can recognise my reflection in a mirror. She’s like me. Like I was. Getting it right, all the time, mattered to me then, and I still struggle with it mattering to me now. It is still a process of catch and release – catch it in the act and release it rather than let it take over. I didn’t fix it for her this time although my mind was racing with thoughts on how I could swing it. I chose instead for her (us) to grow through it. With the help of some beautiful friends and a little bit of Taylor Swift and ‘Shake It Off’, in a few minutes she pushed me away with a smile and an “it’s OK now mum”. I take this as a small but powerful victory over perfectionism. That in that moment, she (we) moved past the fear lurking beneath perfectionism and she allowed herself to be – different, wrong, not perfect but still worthy. Still OK. The world hadn’t changed. She was still loved, liked, the same. I am hopeful that she will not strive into adulthood but rather arrive there, with confidence, resilience, humour and the grace to let go; that she won’t forever feel her worth attached to achievement but instead know her worth arrived the same time her body did; that she won’t be muted by the fear of failure and instead see fear for what it is and try anyway. Because there are enough of us already trying to unlearn these things. A generation of women who have striven to be ‘good’ – to do well, handle it, manage and above all, succeed even when it hurts. It drives us to take on impossible loads – to juggle too much, try too hard and when we stumble under the weight, feel mortified that we will be judged a failure, less worthy, not good enough. Incapable. Perfectionism has many drivers, not the least being a need to impress. But beneath all of it is fear – a fear that we will be shun, not accepted, thought less of, loved less, or somehow not fit in if we are in some way less than ‘perfect’. If we don’t match, meet a standard, tick all the boxes, get everything right. It’s great to achieve. It’s to be encouraged and applauded. It’s fantastic to create, fulfill your potential, to grow. It’s also admirable to do the right thing, for the most part. It’s when we tie our value and worth to a standard though, that our efforts are no longer about doing our best. When we are mortified by our inability to manage; when we feel we are letting someone down by our human limitations; these are indications that fear is running the show and most probably creating grief, anxiety and stress in our life. It is this fear, cloaked in a veil of perfectionism, that stops us from asking for or seeking help when we most need it. We deny ourselves the very things that would help us actually achieve what we are trying to manage because we see struggle as weakness and weakness as a sign of unworthiness. It’s not your standards you need to drop, but the fear setting them for you.